Christian Box (William Baldwin) and his wife Kenna are the best undercover team on the force, until a botched drugs sting leaves Kenna dead. Enraged, Box goes on a rampage that leaves him disciplined and demoted to working in the evidence room. 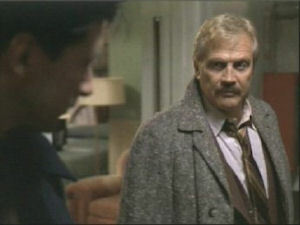 Two years later, Box' ex-partner Nemanski involves him in a phoney drug deal to catch Reuben (Vincent Castellanos), the dealer who ordered Kenna's death. but Reuben fails to show up, sending his fiancée Nikki (Brigitte Bako) instead. However, the money goes missing and Nemanski's body is discovered in the hotel room where the exchange was to take place. Now the primary suspect in his partner's murder, chased by cops and mobsters alike, Box and Nikki travel to Reuben's mountain hideaway for the ultimate confrontation. The movie starts with the death of Baldwin's wife, amidst a not too convincing action set-piece, and not having even been allowed to get to know his wife, it is hard to feel any sympathy with the character and his subsequent actions. The story goes from A-to-B-to-C in very formulaic fashion. We are promised an action-thriller, but it never gets very thrilling and the action is bookended to the opening and closing of the movie. The film treads the familiar ground of a maverick cop out for revenge, and coupled with weak scripting and characterisation, it is difficult to feel involved with, or care about, any of the characters. There is very little back-ground on any of the characters and there is almost no effort made to expand them beyond what is necessary to move along the plot. The opening sequence with the death of Box's wife needed to be about 20-30 minutes into the movie, after we had grown to know and care for the husband and wife team, not immediately after the opening credits. With the front-end of the story botched, the rest of the thing follows a similar pattern. Most of the actors are just called upon to deliver two-dimensional dialogue, to stereotype characters, and even Baldwin fails to bring the movie to life, despite a promising show in movies such as Backdraft, and Fair Game - whatever you think of Cindy Crawford 'Game had some good action set pieces and a couple of good looking stars you cared about if only for the odd 90 minutes. Baldwin's name raises the expectations for PS, something the producers were obviously aware of when casting him, but the material is beneath him and a lesser straight-to-video star such as could have done just as good a job. Lee plays John Blake, Box's boss. 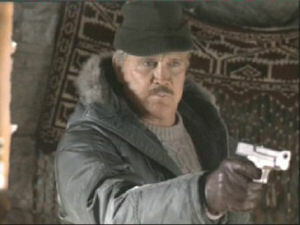 He has some four scenes throughout the movie, which range from just standing in the background passing the odd comment, to taking a major role in the story's resolution. It's always good to see Lee in something new, and in a role which takes him away from the usual 'hero' type he is so often recognised for, and he does at least get to show several different facets of his character even if they are alittle predictable. Like everyone else, Lee, at times, just seems to be going through the motions with his character and he isn't really called upon to do anything stretching. 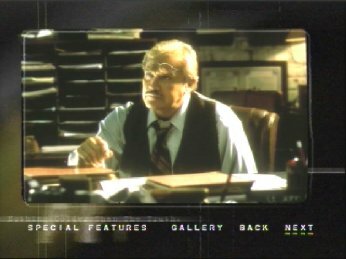 The oddest thing in the movie is that to show the passage to time during which Box spend two years working in the police evidence room, suddenly Lee's character grows a moustache!. Why the decision for Lee's character's to sport facial hair should equate with the passage of time, is baffling, especially when no else seems to have been singled out for change. Also, the fact that Lee's one small scene prior to this is a very brief one, most people, outside of genuine fans, wouldn't even notice the difference anyway. Go figure!. In the right hands, with a good budget, some "name" stars, and a competent action director, PS could have delivered the goods and been a cracking thriller. However, for this production, lower you expectations, get in a pizza, crack open a few beers, and you can probably pass away 90 minutes without too much problem. 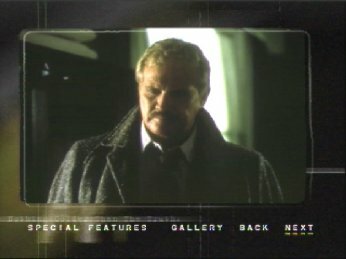 Along with a video rental release, 'Primary Suspect' also gets a DVD sell-thru release, as if often the case these days. It is nice to report, that despite being less than an A-grade movie, Mosaic have seen fit to include some nice extras on the disc:scene index; trailer; cast notes; and a photo gallery. 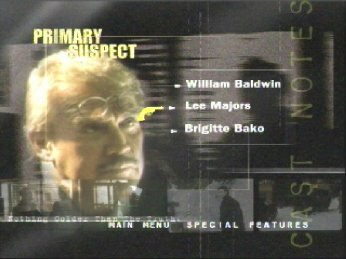 There are cast notes/biographies for William Baldwin, Bridgitte, and Lee. Lee's run to a large 7 pages, and is quite in depth considering similar biographies I have seen on other DVD discs. 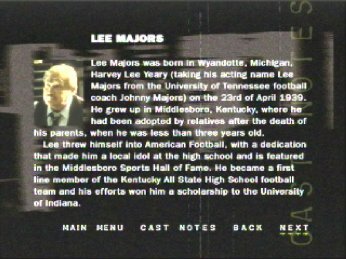 The only disappointment is that is finishes around the time Lee was cast in SMDM, and describes Own Marshall as a 'Western'!. Otherwise is it very thorough. The Photo Gallery consists of 12 photo's from the movie, 2 of which feature Lee - see below. The picture quality, and sound, are of a high standard - as would be expected from the DVD format - and as DVD releases go, this one is good value for money. If only, because how often can you go out and buy a DVD movie featuring Lee in a leading role..or any role come to that?